A member of Cuba's church leadership kisses the hand of Pope Francis as Cuban President Raul Castro stands alongside during the pope's arrival ceremony at the airport in Havana, Sept. 19, 2015. Pope Francis landed Saturday in Havana, launching a historic 10-day trip to Cuba and the United States, and he praised the detente between the two long-estranged neighbors as "an example of reconciliation for the entire world" that "fills us with hope." Francis called the thawing of relations between the two nations — in which the Vatican played a central role — "a sign of the victory of the culture of encounter and dialogue." The pope will celebrate Mass in Havana's sprawling Revolutionary Square on Sunday before meeting privately with Cuban President Raul Castro. He will also travel to the cities of Hoguin and Santiago during his three-day visit to Cuba, with plans to hold Mass and meet with Catholic clergy in each city before departing for Washington. The pontiff was greeted at the airport by the Cuban president, who in his welcoming remarks assured Francis that religious freedom is "consecrated in Cuba's constitution." 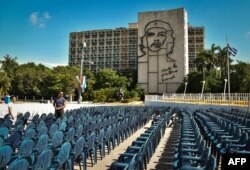 View of Revolution Square where the Pope Francis will celebrate a mass, in Havana, Sept. 18, 2015. In a 15-minute speech that quickly turned political, Castro repeated calls for the U.S. to end its embargo of the island, which he called “cruel, immoral and illegal,” and for the return of Guantanamo Naval Station. The United States' U.N. ambassador in turn tweeted criticism of Cuban authorities over reported detentions in advance of Pope Francis' visit. Ambassador Samantha Power's tweet said human rights activists "and even homeless reportedly detained before @Pontifex visit; disappointing business as usual for #Cuban govt." Pope Francis will be welcomed as something of a hero to Cubans, who credit him for helping restore diplomatic relations between the U.S. and Cuba. Cuba's government launched an effort to bring crowds into the streets of Havana. 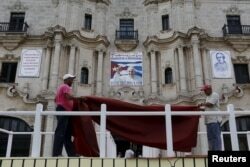 Workers do the final touches to one of the podiums near Havana's cathedral, that will be used during visit of Pope Francis, Cuba, Sept. 17, 2015. Officials offered a day's pay, snacks and transportation to state workers to gather along the pope's route from the airport to the papal ambassador's home. University students were also recruited to turn out. Pope Francis and Vatican officials facilitated several months of secret talks between Havana and Washington in 2014 that ended with last December's historic announcements by Castro and President Barack Obama that the two countries had decided to re-establish diplomatic ties. They have since reopened embassies in Washington and Havana. Relations began unraveling after Castro's brother, Fidel, overthrew President Fulgencio Batista on New Year's Day 1959 and established a communist dictatorship, taking over U.S. assets. The U.S. severed diplomatic ties with Havana two years later and imposed a total economic embargo in 1962. 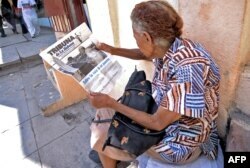 A woman reads 'Tribuna de la Habana' newspaper in central Havana a day before the visit of Pope Francis to Cuba on Sept. 18, 2015. Pope Francis' trip to Cuba will be the third papal visit to the communist nation over the past two decades; John Paul II visited in 1998 and Pope Benedict visited in 2012. The pontiff's U.S. schedule will include a private meeting with Obama, who will greet Francis when he arrives at Joint Base Andrews outside Washington; speeches before a joint meeting of the U.S. Congress and the United Nations in New York; and an appearance before a Vatican-sponsored World Meeting of Families in Philadelphia.